Reduce, Reuse, Recycle is the recycling world's mantra, or at least until recent times. While the original Three R's are important, zero waste advocates know successful systems expand well beyond and deeper within the original Three R's. At the U.S. Zero Waste Business Council's 2012 conference keynote speaker Eiko Risch of Ricoh Electronics explained how the common three R's were expanded to Ricoh's Five R's: Refuse, Return, Reduce, Reuse and Recycle. Refuse = Avoid buying anything that becomes waste. Return = Return packaging materials to supplier for their Reuse. Ricoh works in partnership with their suppliers on evolving packaging that eliminates waste and creates reusable materials. For a conference recap, see the ZWA Blog post, U.S. Zero Waste Business Council Hosts First Rate Conference. During her presentation, Eiko emphasized the partnership role with suppliers along with employee engagement as key to their success. The teamwork necessary to achieve zero waste status was highlighted in the ZWA Blog post, Zero Waste is a Team Sport, where the WE Consciousness was introduced. Ei Partner Bruce Buchan, CleanRiver Recycling Solutions founder & CEO, augments the Three, or now Five, R's with the Three C's: Culture, Communication and Collection. As an early recycling pioneer, Bruce knows first-hand culture, communication and collection are the backbone of effective recycling programs. In order to accomplish the RRR's the CCC's must first be in-place. CULTURE - top management sets the organization's culture and "puts the stake in the ground” on the expectations of program participation by all employees. It is important recycling practices are presented as new standard operating practices, valuable to the organization's bottom line. COMMUNICATION - the company's recycling commitment must clearly communicate expectations and goals to employees. Assessing the baseline, or current scenario, is key to setting achievable goals associated with specific timelines. Reporting progress to employees, along with successes and challenges, is critical to maintaining program enthusiasm. COLLECTION - beyond containers, collection is the interface between the RRR's and CCC's. Understanding where material is generated is key to effective bin design and placement. Reviewing current waste | recycling hauling contracts may improve collection efficiency, reduce costs and create a partnership, versus vendor, relationship with the hauler. Communication interfaces with collection when determining appropriate graphics at recycling stations. CleanRiver, a prominent recycling bin manufacturer, is committed to long-term client partnerships and offers a wide variety of services that stage recycling programs for success. With an in-house graphics department and print shop, CleanRiver works with clients to design bin and collection area signage to fit unique front and back-of-the-house scenarios. Additionally, clients have access to CleanRiver's industry expertise as an added-value. At CleanRiver recycling is integral to their manufacturing process and product end-of-life options. Bins made from recycled plastic boards, a popular client choice, may be returned to CleanRiver at end of use for its next life. Within their Cradle to Cradle manufacturing process, CleanRiver returns plastic debris inherent in bin construction to their supplier for future plastic boards. When an organization decides to embrace recycling within internal operations, a team approach is necessary with suppliers, employees and waste | recycling haulers. Zero waste success stories are abundant and the forerunners are happy to share the steps taken within their organization. Remember Culture, Communication & Collection are a necessary precursor step to Reduce, Reuse & Recycle success. Thank you Bruce Buchan for sharing your vision and expertise! ZWA Blog Hits 75,000 Pageview Milestone! Yesterday the Zero Waste in ACTION Blog surpassed the 75,000 pageviews after hovering at 74,999 for awhile! Launched in 2009 along with the Zero Waste Zones program, the ZWA Blog grew into a powerful industry communication tool. Committed to sharing success stories and challenges from an empowering viewpoint, the niche blog quickly earned industry respect and a strong following. In 2010 The IMPACT Blog launched to share Elemental Impact work in areas other than zero waste. Realizing the power of a cyberspace network, Ei participates in social media venues frequented by the targeted audience. The Ei FaceBook page is an excellent venue to share blog posts, Ei Partner activity and industry news. Understanding the value of visual communication, the Ei FB page has an impressive 60+ album inventory complete with detailed descriptions. In general, each album supports a blog post. LinkedIN is an amazing and effective business tool. Once Ei founder Holly Elmore started sharing blog posts via group discussions, the blog readership escalated significantly. Although Ei has a LinkedIN profile, posts are via Holly's personal account. In addition, many dynamic relationships resulted from LinkedIN interactions. For instance, zero waste icon Scott Lutocka of Piazza Produce was a connection from the LinkedIN Zero Waste International Group. Scott joined the ZWZ and started serving as an Ei industry expert from his hands-on zero waste success. The ZWA post, Zero Waste is a Team Sport, gives an overview of the Ei Piazza Produce tour as well as introduces the WE Consciousness. In the last six months Ei entered the Twitter world via active participation. Immediately, blog post readership once again escalated. Beyond building the cyberspace network, Twitter is an excellent vehicle to keep current in industry news. It is also an easy, effective avenue to celebrate success with a simple "favorite" and|or "retweet". The Ei Pinterest page includes twelve category boards with 200+ "pins." Each board represents a subject category with ZWA and The IMPACT Blog posts "pinned" on appropriate boards in reverse chronological order. Although specific following is interesting, blog readership escalated when the Pinterest Boards were complete. Pinterest appears to enhance optimal search engine placement. Communication and media is evolving from the printed word to on-line vehicles . For impact, it is important to create a cyberspace communication network. Blogs and websites are the grounded focal point with the other vehicles driving traffic via quick snippets within the network. Thank you for your support in building the ZWA Blog readership foundation - now let's together build the network! You are invited to join us with "likes" on FB, "connections" on LinkedIN, and "follows" on Twitter and Pinterest. As host to the 2013 NCAA® Men’s Final Four®, the second most popular sporting event across the globe, Atlanta will be center-stage in the sports world April 5 through 8. A veteran to hosting world-class events, Atlanta was the home to the 1996 Summer Olympic Games and the 2013 Final Four is Atlanta's fourth time hosting the NCAA Men’s basketball tournament. What makes the 2013 Final Four Atlanta extra special? First, it is the 75th Celebration of March Madness®. Second, for the first time NCAA Division II & III Men's Basketball Championships are held in the same city with games played at Phillips Arena - games are free and open to the public on Sunday, April 7. Third, Atlanta civic, government and corporate leaders are teaming together to ensure the tournament leaves a green footprint before, during and after the games. 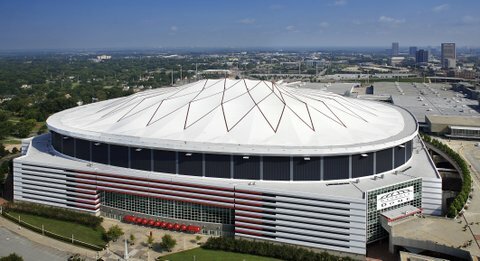 The Division I national championship games will be played at the Georgia Dome, one of three facilities under the Georgia World Congress Center Authority umbrella. Sister facilities include Centennial Olympic Park and the Georgia World Congress Center, the nation's fourth largest convention center. A sustainability hero, the GWCCA hosted the 2009 acclaimed Zero Waste Zones press conference launching the groundbreaking program. In late 2010 the GWCCA welcomed Tim Trefzer as the campus director of sustainability in a new position dedicated to taking sustainability action beyond in-place zero waste practices. One of Tim's first projects was retrofitting the campus lighting via a $2.3 million grant secured through the GA Environmental Finance Authority State Energy Program. The IMPACT Blog post, GWCC Rolling in the Green, gives details of the lighting retrofit. Under Tim's leadership, the City of Atlanta is showcasing the power of team spirit with a stellar Atlanta Local Organizing Committee’s Sustainability group.Team building began via a community call to action: hosting a major sporting event grounded in environmental respect. A powerful cross section of community leaders answered the call to volunteer their time, expertise and resources. Representatives from government: City of Atlanta Office of Sustainability and U.S. EPA Region IV, civic & industry associations: Central Atlanta Progress and the Green Meeting Industry Council, non-profits: Elemental Impact,Southface and Sustainable Atlanta, education: Georgia Institute of Technology and corporate: Coca-Cola Recycling and Phillips Arena serve on the ALOC Sustainability group. Saturday, March 9 10:00 a.m. - 3:00 p.m: e-waste recycling drive in the Silver Lot of the GA Dome; no charge for any electronics brought, including televisions! Monday, March 18, Sunday March 24 and Tuesday, March 26: clothing & textile drive by American Textile Recycling Services | City of Refuge in conjunction with volunteer orientation sessions. The City of Atlanta is providing 200 96-gallon containers along major downtown streets surrounding the GWCCA campus, hotels and restaurants to enhance event recycling. For back-of-the-house recycling, the GA Dome is adding 150 temporary bins. Communication tools and public service announcements are in development to educate fans about recycling, public transportation and other green initiatives associated with the games. On Sunday, April 7 a bike valet is scheduled to encourage and educate on human-powered transportation options, especially for local fans. To keep the event production carbon-neutral, Renewable Energy Credits will be purchased from Georgia-based sources to offset GA Dome and Phillips Arena game days. In addition, volunteer shirts and lanyards are made from recycled material. Banners will be repurposed post game. Electronic communication is used as much as practical with volunteers and fans; printed material includes a recycling reminder. These green footsteps are destined for long-term impact ranging from the tree planting to fan education on responsible daily action. Atlanta showcases the community team spirit necessary for success where all win, including the environment. The Magic of Compost was evident during the U.S. Composting Council's 2013 pre-conference Tour of Central Florida Composting Facilities. A bus filled with enthusiastic conference attendees spent the day touring C & C Peat Co and the Vista Park Organics Recycling sites. Common ground for the two facilities included: 1> the Walmart pre-consumer food waste intake and 2> ample permitted food waste capacity. C & C Peat Co., a family-run business co-founded in 1981 by Stephen Cook, was the first tour stop. As a horticulture company, C & C Peat produces USDA Bio-Preferred Certified products sold in bulk to nurseries and operations with significant grounds maintenance, such as Sea World. For C & C Peat the main intake for the compost operations is horse bedding from Central Florida thoroughbred racing stables, typically pine shavings. In addition to the horse bedding, C & C adds pre-consumer food waste and slurry (2% bio-solids) from the adjacent water treatment plant. Due to concern over herbicides and pesticides, C & C Peat does not accept yard trimmings as a carbon source for their compost recipe. Sand, pine bark sent through a 7/8 inch screen, Canadian Sphagnum peat and time-release fertilizer pellets are added to the compost to produce the C & C Peat end product. During production, each 5 yard mix increment must be consistent when it goes into the blender, shredder, and screener to ensure a consistent load after processing the entire batch. Loads may be as large as 80 cubic yards. Simplicity is one of C & C Peat's key ingredients to producing their high quality product. Even without the technology bells and whistles, C & C Peat has an impressive equipment capital investment required to convert manure, food waste and bio-solid slurry into a valuable horticulture product. During the tour, Steve confirmed C & C Peat would accept post-consumer food waste including certified compostable packaging, as long as the feedstock is reasonably contaminant-free. For a pictorial recap of the tour, visit the Elemental Impact FB album, 01-28-13 C & C Peat Tour. In time for lunch provided by Publix, the tour group traveled to Waste Management's Vista Park Organics Recycling located at their Apopka landfill. As a response to Walmart's food waste composting commitment, WM invested in a 12-acre, 30,000 yard capacity aerated static pile system. Feedstock includes pre-consumer food waste and woody yard debris. Garick oversees operations and end product sales. After mixing the intake into the proper recipe ratios, the food and woody debris are transferred to concrete bunkers with negative air filter slabs. The filter system keeps the piles aerated, which prevents methane gas production during decomposition, and pulls air filled with "smelly" microbial activity into a cedar bio-filter. Every 15 days the piles are moved to the next bunker until the compost is finished in 60 days. Garick sells the compost in bulk under the Organic Valley Compost brand. Local residents may purchase the bulk product Monday through Friday at the facility. For a pictorial recap of the Vista Park site tour, see the Ei FB album, 01-28-13 WM Composting Site Tour. While many communities lack food waste composting destination sites, Central Florida is blessed with two open, permitted facilities operating well under their food waste intake capacity. With Orlando close-by, it is perplexing to know food waste travels to landfills with available local alternatives. The USCC | National Restaurant Association partnership is designed to equate the supply and demand challenges inherent within mobilizing the foodservice industry to source-separate food waste for composting collection. Central Florida is ripe for equating the ample food waste supply available with the composting site destination demand. For details on the USCC | NRA partnership, see the ZWA Blog, Collaboration is Key to Success. To experience the magic inherent within the 2013 USCC Conference, read the ZWA Blog post, Compost, A Magical Experience. It is empowering to witness an ancient industry rediscovering its identity within modern times and innovative technologies.. The U.S. Composting Council hosted their 21st Annual Conference & Tradeshow, The Magic of Compost, January 28 - 31 at the Buena Vista Palace in Downtown Disney, Orlando, Florida. Although The Magic of Compost was a play on the Disney location, there was mega magic in the conference energy. Industry colleagues and dear friends from across the Americas converged on the Magic Kingdom to learn, share and explore the composting industry current status and future directions. Beyond the superb pre-conference tours | workshops, conference sessions and post-conference equipment demonstrations, energy sparkled during the abundant social interactions, where the "real business" happens. Via Partners, Strategic Allies, Advisory Council Members and staff, Elemental Impact was well-represented at the conference. Beginning with the Pre-Conference Composting Facility Tours, Ei founder Holly Elmore joined Ei Partners Chris Bradlee (BASF), Tim Goodman (Natureworks) and Ernie Lefler (Quantum Leap Enterprises) along with Strategic Alley Matt de la Houssaye of Global Green's CoRR for a day touring food waste destination options in Central Florida. For a recap of the fantastic tours, see the ZWA Blog post, Central FL: Ripe with Options for Food Waste. The conference officially opened with an excellent morning plenary session featuring keynote speaker Vonda Lockwood, Walmart director of sustainability for U.S. operations. Vonda's tenacity was vital to Walmart taking the national leadership role in commercial food waste diversion from landfills. "Opportunities and Barriers to Compost Industry Growth," a panel of industry leaders, wrapped up the morning plenary session. Mitch Kessler of Kessler Consulting was an entertaining panel moderator. Ei Advisory Council Member Scott DeFife, National Restaurant Association executive vice-president government & public affairs, received a mini roast as part of his panel introduction. Humor is an effective communication tool and Mitch set a fantastic tone for the crowd to "hear" the panel's important industry messages. Scott was joined by George Dreckman - City of Madison, William Caesar - Waste Management, and Jeffrey Leblanc - Wecare Organics for a diverse, balanced panel. After his pertinent prepared questions, Mitch reserved ample time for audience questions. In the afternoon Ei Advisory Council Member Lynn Dyer - Foodservice Packaging Institute president - moderated an impressive session on compostable packaging. Caitlin Leibert, Chipotle Mexican Grill sustainability coordinator, gave the foodservice operator perspective while Georgia Pacific and MeadWestvaco represented the packaging manufacturers. Tim Goodwin of NatureWorks gave a resin-provider as well general industry viewpoint. Noel Lyons' of McGill Environment Systems input as a composting facility operator was essential for grounding the panel discussions. On the conference opening day, tradition dictates an early evening reception in the exhibitor hall before folks embark on dinner adventures. The reception is perfect for new friends and long-time pals to relax, review the day's powerful sessions and plant seeds for important future action. Ei's compost experts were happy to spend time together as the reception closed: Brenda Platt (Institute for Local Self-Reliance) - compostable packaging , Wayne King (ERTH Products) - composting best practives and Britt Faucette (Faucette Consulting) - the scientific & microbial aspects. On the second and final educational session day, Ei founder Holly Elmore joined colleagues to present on the Food Waste in Focus panel moderated by Tim Goodman of NatureWorks. As the opening presenter, Holly shared the successes and challenges inherent in bringing zero waste practices, including food waste separation for composting, to food court operations. Holly's slide on the NRA's purchase of the Zero Waste Zones in late 2012 was a natural segue for Jeff Clark with the NRA to present on the strong USCC | NRA relationship. In addition Jeff showcased the NRA foodservice sustainability programs and policies in development stages. As part of the food waste panel, Robin Sweere of Sweere Consulting gave an informative overview of retailer food waste culture and practices in-place, or lack thereof. Dan Matsch of Eco-Cycle, a Boulder non-profit, gave an excellent presentation of the community successes and challenges with food waste collection for compost. At the conference, Ei focused on food waste and packaging oriented sessions. Yet the educational opportunities ran the gamut for those interested in any aspect of composting ranging from technologies, equipment, legislative updates to odor prevention | control. For a pictorial conference recap, visit the Ei FB album, 2013 U.S. Composting Council Conference. The Magic of Compost - a perfect description for the excellent conference. After all, the microbial community is its own magical kingdom!